In the past, many workers could rely on so-called defined benefit pensions provided by their employers, which promised retirement payments based on a worker’s salary and years of service. In the private sector, those once common pensions have all but disappeared. To a large extent, they have been replaced by defined contribution plans such as 401(k)s.
The value of the newer brand of pensions depends largely on how much workers have paid into them and how successfully the investments in the accounts perform. The shift from defined benefit to defined contribution plans essentially has transferred the burdens and risks associated with providing retirement savings from employers to workers. 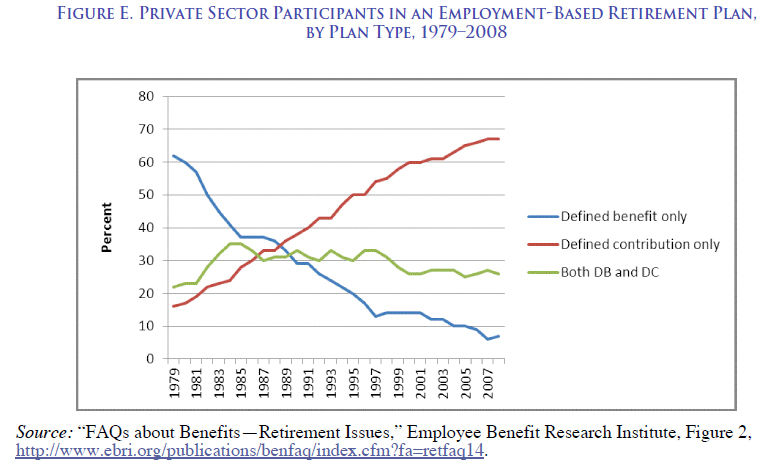 The graph above shows this sea change in private sector pensions. Among workers with some form of retirement plan, the share with only a defined benefit pension declined from 62 percent in 1979 to 7 percent in 2008. Sixty seven percent of workers with a retirement plan in 2008 had only a 401(k)-type defined contribution plan. The decline of defined benefit plans has reduced the retirement security of a large share of the workforce, making them more reliant on highly unpredictable and volatile savings plans. In addition, middle- and lower-income workers, who are less likely to participate in defined contributions plans, are now less likely to have any form of pension support at all. Average life expectancy increasing – but for whom?